After you have protected your documents by using Azure Information Protection, you can track how people are using these documents. If necessary, you can also revoke access to them if people should no longer be able to read them. To do this, you use the document tracking site. You can access this site from Windows computers, Mac computers, and even from tablets and phones. When you access this site, sign in to track your documents. When your organization has a subscription that supports document tracking and revocation and you are assigned a license for this subscription, you can see who tried to open the files that you protected and whether they were successful (they were successfully authenticated) or not. You also see each time they tried to access the document, and their location at the time. However, in rare cases, the location reported might not be accurate. For example, when a user opening a protected document is using a VPN connection, or their computer has an IPv6 address. Unless you are an administrator, you can track and revoke only the documents that you have protected. You cannot track your protected emails by using the document tracking site. If your administrator has configured privacy controls for the document tracking site, you might not see when users from your organization have accessed a document that you track. An administrator can exempt all users or just some users. However, you can always revoke access to the documents that you track. 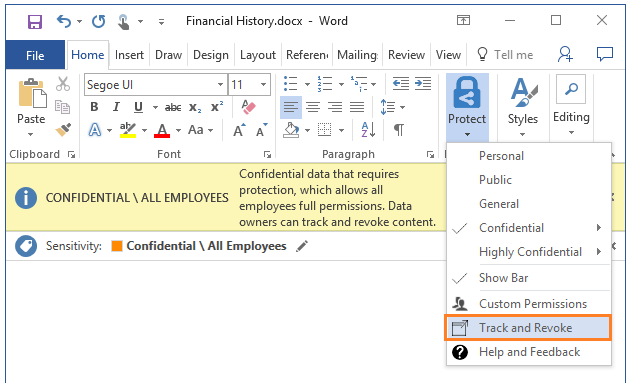 To track a document that you have protected, you must use your Windows computer to register it with the document tracking site. To do this, use either File Explorer, or your Office apps. If you have the current general availability version of the Azure Information Protection client, you can also register the protected document with PowerShell when you use the EnableTracking parameter with the Set-AIPFileLabel cmdlet. Open the protected document that you want to track or revoke. The Azure Information Protection client is not installed on your computer. Your Office applications must be restarted. Your computer must be restarted to complete the installation. For more information about how to install the Azure Information Protection client, see Download and install the Azure Information Protection client. Right-click the protected file, and select Classify and protect. From the Classify and protect - Azure Information Protection dialog box, select Track and revoke. Using your Windows PC, Mac computer, or mobile device, visit the document tracking site. See Configuring and using document tracking for Azure Information Protection from the admin guide.